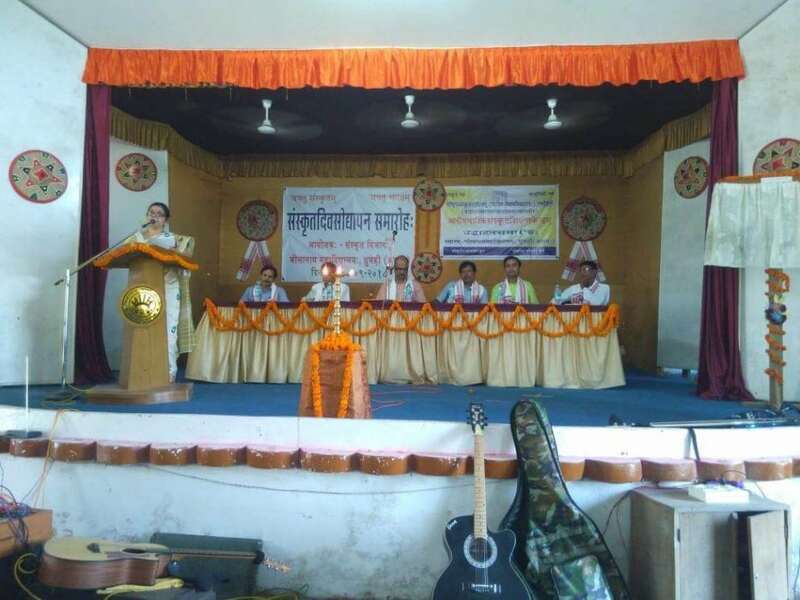 DHUBRI: Sanskrit Day was observed in Bholanath College here under the auspices of Department of Sanskrit at the college auditorium recently. The programme was sponsored by Rashtriya Sanskrit Sansthan, New Delhi which also runs a non-formal Sanskrit Education Centre in the college. On this occasion, ‘Vadatu Samskritam’, a small project prepared by the Department of Sanskrit, was also formally unveiled by the Principal of the college, Dr Dhruba Chakrabortty. The meeting was presided over by the Principal while former District and Session judge, Murari Mohan Sarkar was the chief guest of the meeting. Altogether 138 students and 35 teachers of various departments were present in the meeting. Murari Mohan Sarkar expressed his opinion that Sanskrit culture should be honoured for the enrichment of the human resources of the country. Dr. Dwipendra Kr. Adhikary, Dr. Akabbar Ali and many other lecturers stated that Sanskrit deserved a respectable status and all the speakers lauded the step taken by the Rashtriya Sanskrit Sansthan for popularizing Sanskrit. Speaking as the appointed speaker, Ganesh Vatsa highlighted the inherent strengths of Sanskrit and mentioned the new avenues that might be adopted by the students of Sanskrit while principal Dr. Dhruba Chakrabortty highlighted the rich heritage of Sanskrit and cited a few points to show the importance of the language from scientific and psychological point of view. Dr Chakrabortty also formally inaugurated the non-formal Sanskrit Education Centre which would be continued for 10 months for popularizing spoken Sanskrit as well as Sanskrit culture in this region of lower Assam.